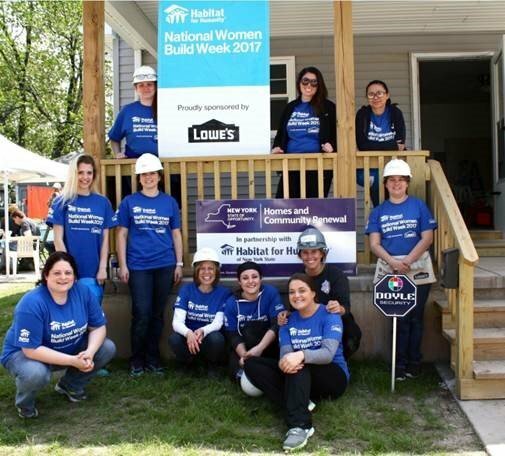 Last month, Gross Polowy took part in Habitat for Humanity’s Women Build Week. This is the first year Buffalo participated in this nationwide event. The build week program highlights the challenges women face as homeowners and empowers women to make a difference in their homes and in our community. Our team spent the day helping to lay the foundation of two homes in Buffalo that will be offered to low-income families at an affordable rate. Not only did we have a very successful build day, Gross Polowy was also the breakfast sponsor for all the groups who volunteered for this awesome event. Due to the demand from the community and local businesses, Habitat for Humanity Buffalo will be continuing the Women Build project every Wednesday throughout the rest of the year. Gross Polowy is assembling a team to help out this Summer!